9 entries categorized "Geek of Catblogging"
When we suddenly had to go to California a couple of weeks ago, we quickly rustled up a catsitter to look after Demetrius. 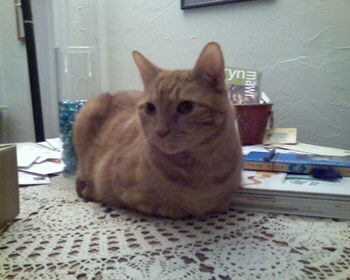 Lisa came in twice a day to give Demetrius his insulin injections, feed him, and play with him a little. She left us a little journal of her visits with him. Here are some excerpts, illustrated with some pictures I've taken of Demetrius over the last week or so. Sat. pm Hiding in the dining room. Let me carry him out - so he may not have been hiding. Sun. am Ate his treats right away - is eating food really well. Seems happy. Sun. pm Got some brushing in. Lots of rolling around and head butts. Mon. 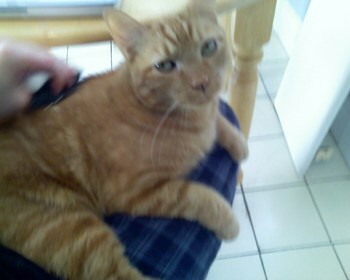 am Very affectionate - must mean he likes me. Or maybe he misses you guys. Regardless, it was very nice company for both of us. He hung out on the floor in the kitchen - doing "rollies" on his back. Tues. am Very vocal. I think he misses you guys - he's waiting by the door. I keep telling him very soon they'll be home. Tues. pm Doing very well. Still came out when I called him. He knows me well now. We're buddies. More brushing. He loves it. He's so affectionate. 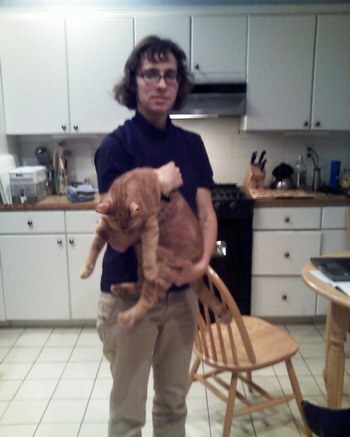 And next, hanging out in the arms of my friend C. He doesn't look terribly dignified, but I am confident that he is adequately supported, because C. is a veterinarian and, as she put it, "I hold a lot of cats." Also, while I know this is cheating a bit - since it isn't my cat - I'd like to call out the amazing Flickr collection of airborne cats, taken by a man named Junku who has posted hundreds of beautiful cat photographs. I can't show you his pictures here, so you'll just have to click on the link. Demetrius is diabetic, and we give him insulin shots twice a day. So when we head to the Berkshires for a weekend, we usually bring him with us. 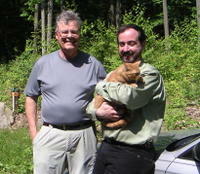 I've written about Demetrius in the Berkshires before, but not about the journey. We've noticed that Demetrius is much less miserable if we let him out of his cat carrier in the car and let him sit wherever he wants. In his box, he meows constantly and pathetically. When he's free, he's still not happy, but he's much, much calmer. 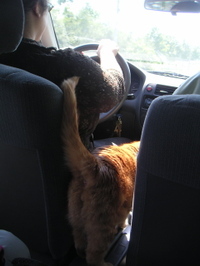 He usually plants himself flat on the lap of whichever of us is in the passenger seat. 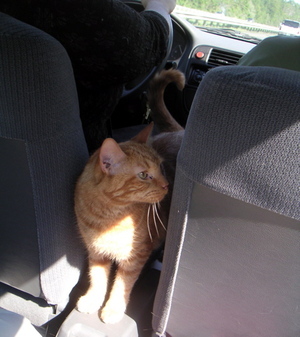 Sometimes, though, he roams around the car and gets curious. 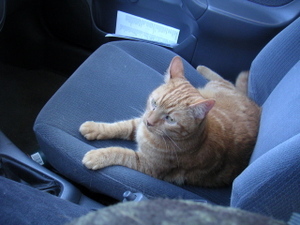 With the car stopped and David out for a minute, Demetrius made himself comfortable. He's a very docile cat, and we don't even really need to use his carrier - even out in the open, if he can't be safe in his own home, he'd rather hunker down in David's arms than try to run away. 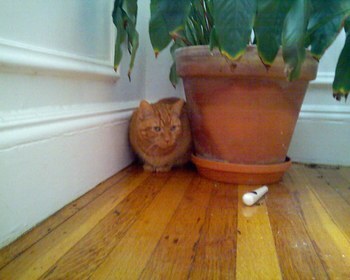 Today's catblogging installment is a historical look at Demetrius as he was when he first came to live with me. Thanks to the Internet Archive's Wayback Machine, I was able to recover some pictures of Demetrius that I took in those days and posted on my first website in 1996. 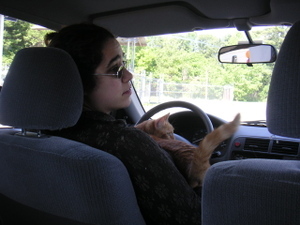 When Demetrius first came to live with me he was a young cat, not really any longer a kitten, but not quite fully grown. 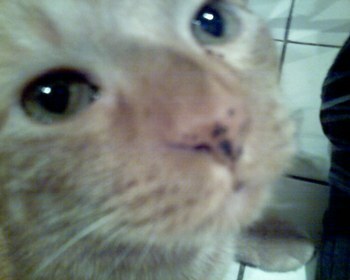 He had been born in Brooklyn, in my parents' back yard, one of a litter of three. After my father rounded up the kittens (their mother practically placed them on my parents' doorstep, but kept herself out of reach), my parents found homes for the other two kittens, but they kept Demetrius, who was the cutest and fuzziest and softest in the litter. 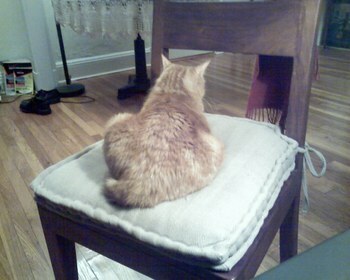 After a number of months, though, it became clear that Demetrius wasn't a happy cat. 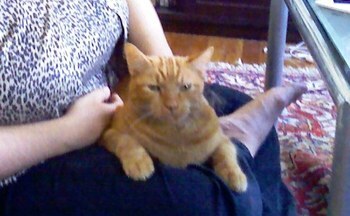 He got along well with my parents' other cat, good old Lysander (now of blessed memory), but he lived in terror of my father and hid under the bed all day, only emerging late at night when my father was asleep and the house was quiet. 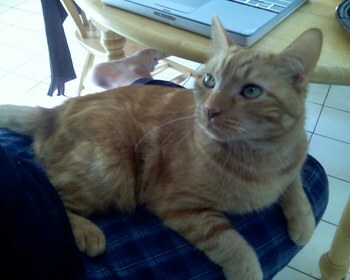 And so, when I decided it was time to get a cat, my parents offered me Demetrius. They bundled him into the car and drove him up to Boston, stopping partway to feed him a little chicken from a roadside Roy Rogers. At my house, Demetrius stayed under the bed for a while, but after a couple of days his curiosity got the better of him and he emerged, meowing. It wasn't long before Demetrius blossomed into the talky, insistent, demanding, and still slightly skittish cat who has made me smile for the last ten years. The pictures in this post show you what he looked like in the first few weeks after he arrived in Boston. Sometimes Demetrius is so relaxed he is almost fluid. When he gets like this, he reminds me of Choo Choo Bear from the webcomic Something Positive. Alright, so it's Saturday. Sorry about that. When we take Demetrius to the Berkshires, as long as my parents and their cats aren't there he has a wonderful time exploring the house and making it his own. Here he is a few days before Thanksgiving, sitting in the sill of the lovely windows that line the back wall of the house, enjoying the autumn scenery. Taking these pictures indoors with the flash had an odd effect. The flash lit up demetrius with artificial, cold white light, while the sunny outdoor background was very natural, warm, and yellow. The result is that the pictures look photoshopped - but they aren't, as you can see by examining the fuzz around Demetrius's tail. 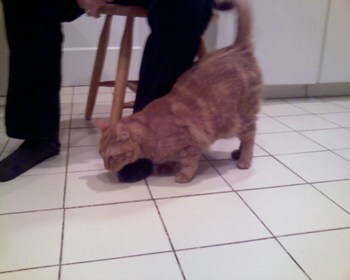 Here is Demetrius in a standoff with my parents' cat, 'Possum. Demetrius is on 'Possum's turf - since he has diabetes and needs insulin shots twice a day, we bring him with us when we visit my folks in the Berkshires. 'Possum won't let Demetrius out of this room. She guards the door with her tail bristled out like a bottlebrush. She'll growl, wail, and hiss at him if he tries to leave. Demetrius takes it all in stride. When the weather is hot, Demetrius flops out on a convenient horizontal surface. The scientific name for this is "exhibiting hot-cat behaviors." I've decided to join the Friday catblogging trend. I don't have a brand new picture because David went to a conference and took the camera with him. So, here's Demetrius, back in January. I'll try to have a new picture next week.